As the seasons change from summer to fall to winter, animals living in more northern climates have three options: migrate, hibernate or bulk up! One of the most amazing migrations is that of the monarch butterfly. 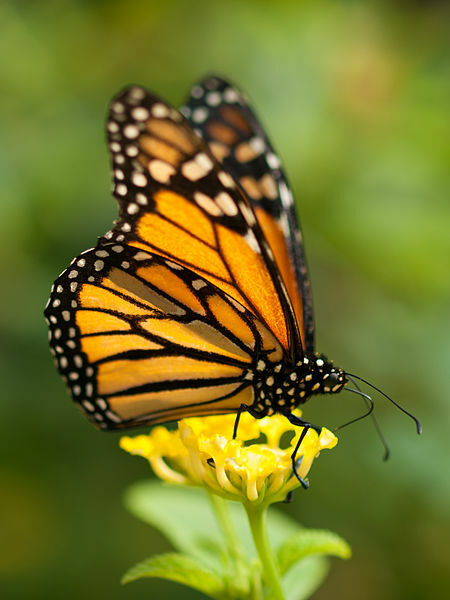 Monarchs are the only butterflies to make a round-trip migration, similar to a bird. Other types of butterflies overwinter as either larva or pupa. Since adult butterflies depend on flowers for nectar they can't find food in areas where snow and ice are the norm. In order to travel long distances (sometimes up to 3,000 miles!) they take advantage of warm pockets of air called thermals, and air currents. Each day they travel 5-100 miles until they reach their winter resting ground. The monarchs that I see flitting about in the Northeastern part of the U.S. will head to Mexico, while those in the Northwestern part of the country spend their winter in California. 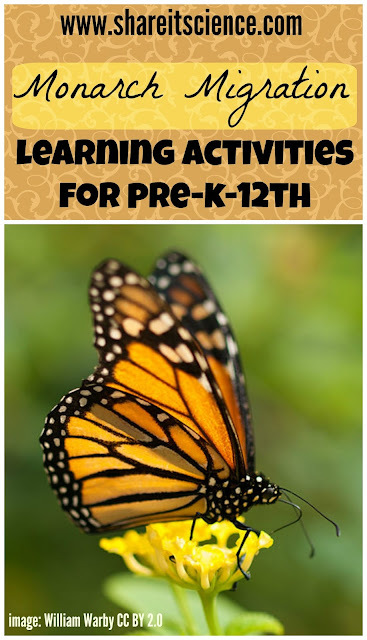 If you're studying monarch butterflies or migration in your school or homeschool there are activities that can be done with all ages. Citizen science projects are wonderful for older students, while younger students enjoy learning about life cycles and the concept of migration. Here are some ideas for learning about monarch butterflies at each age level. Role play the life cycle of a butterfly. Have students curl up in a ball to be an egg, then hatch and stretch and inch along like a caterpillar. Then they'll find a cozy spot and stay still for a bit while they are a pupae. Finally they are ready to climb out of their chrysalis and flap their wings as a butterfly. One of my favorite books to accompany this activity is Lois Ehlert's Waiting for Wings. If it is spring, you can watch a butterfly life cycle right in the classroom. With a live butterfly kit, or possibly with butterflies from your local butterfly conservatory, raise butterflies from eggs, then have a release party when you have adults. Read a story and then show on a globe or map where the butterflies migrate to. Developmentally, maps are a little tricky for Early Childhood, but you will at least be conveying the message that they go from one place to another during migration. One of my favorite monarch migration picture books to read to little ones is Gotta Go, Gotta Go by Sam Swope. 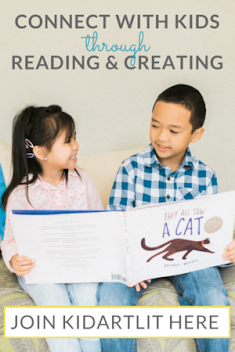 The rhyming text and adorable pictures are perfect for a read-aloud. Watch and learn about monarch life cycles with the Kratt Brothers with this lesson plan and video from Wild Kratts on PBS. These resources are available through PBS LearningMedia, which I highly recommend exploring. There are tons of great resources and short video clips to hook students before you delve into your hands-on lessons. Read Hurry and the Monarch a cute tale of a monarch's life cycle through migration, with lovely illustrations. 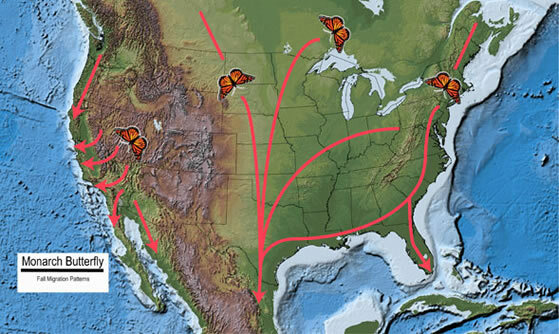 Explore the migration maps at the Monarch Watch site. Go out and observe monarch butterflies and report your sitings too! Plan and research a butterfly garden. In the spring plant some butterfly friendly plants. Find ideas here. Build and observe a butterfly feeder. Directions here. 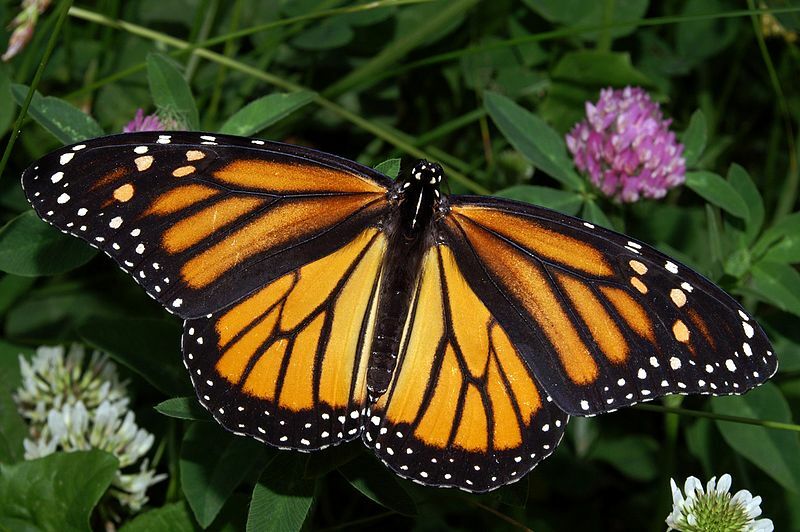 Participate in some citizen science by reporting observations and analyzing migration data of many species including monarchs at the Journey North site. Get a monarch tagging kit here. 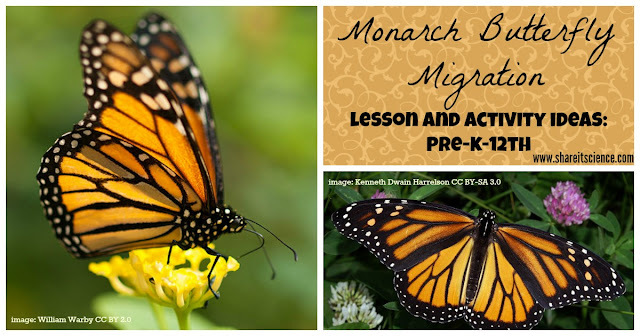 Tag butterflies and monitor monarch migration through Monarch Watch. Track animal migrations on Movebank, then try some of the science projects you can do with this data at Science Buddies. If you are interested in more migration activities, check out my post, "See it? Share it! Bird Migration". For other citizen science opportunities involving insects, read "Insect Investigations: Summertime Citizen Science". Think monarchs are beautiful? I do! Find a great photo and links to monarch photography at the Growing With Science Blog. Like these ideas? Don't miss another post, sign up to receive an e-mail each time one comes out! No spam, just fun science! 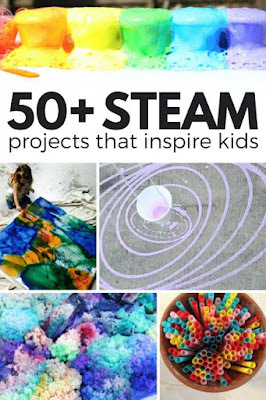 I'm so excited to be reviewing this awesome new book: STEAM Kids: 50+ Science/Technology/Engineering/Art/Math Hands-On Activities for Kids, launching this week. You've no doubt heard a lot about STEM education (Science, Technology, Engineering and Math). Integrating disciplines has tons of benefits, it's great for critical thinking, makes lessons more engaging and teaches skills applicable to real-life scenarios. When you can add Art into the mix to turn STEM to STEAM, then you're also engaging different parts of the brain, inspiring creativity and ingenuity. The best part is, transforming STEM to STEAM is not difficult. In fact, I think it makes everything a bit more fun! The new book, STEAM Kids is just that- fun. 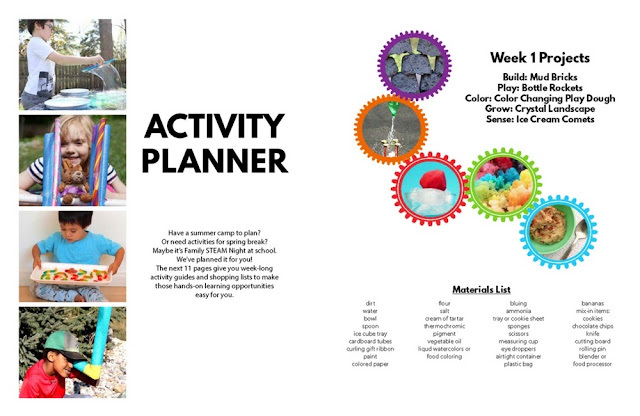 Fun activities don't have to cut learning short, and those included here certainly don't! I love STEAM Kids mission: to inspire kids to "question like a scientist, design like a technologist, build like an engineer, create like an artist, deduce like a mathematician and play like a kid". 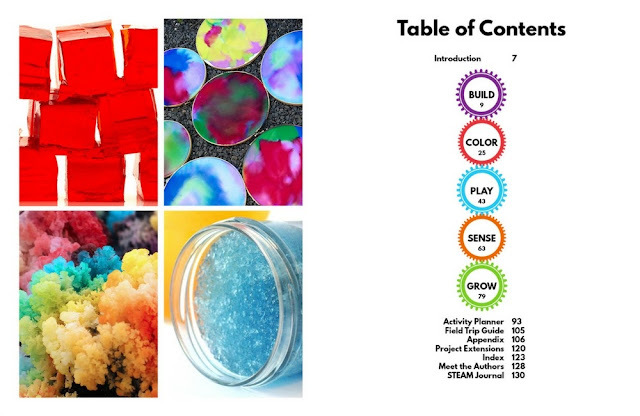 Over 50 projects are organized into 5 different categories: Build, Color, Play, Sense, Grow. With beautiful, colorful images, and easy to follow instructions it is not difficult to be inspired to get building, imagining and creating. I really appreciated that the authors not only included the project's difficulty and approximate time commitment, but also an explanation of the STEAM concepts involved in each project. Some of my favorite activities from STEAM Kids include "Circuit Bugs", a bug building craft where LED lights and wires are used to give the creatures light-up antennae or eyes, and "Color Changing Play Dough" that changes color in different temperatures. 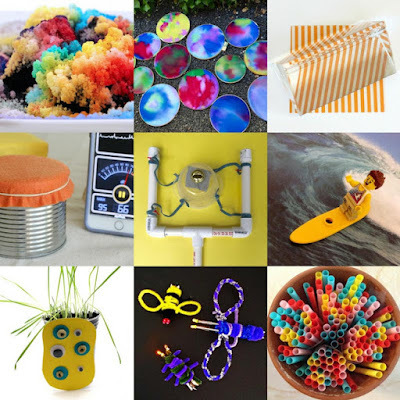 There are new ideas for classic engineering feats to be tackled, like building a contraption for an egg drop, and completely unique new project ideas like "Edible Polymer Gummies" and "Milk Plastic Bracelets". 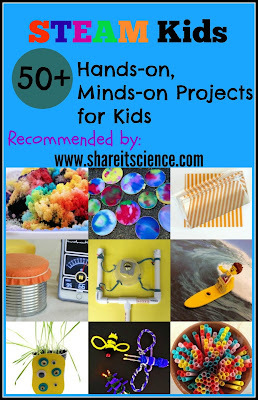 I really liked that the authors included links to their blogs with additional activities to try. It really extends the text as a resource. The book also includes a weekly activity planner with materials and project suggestions, in addition to ideas for field trips and a STEAM journal for kids to use. 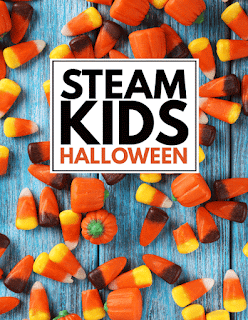 I believe anyone with children, educators, after school caregivers, camp counselors, club and troop leaders would find STEAM Kids to be an invaluable resource to add to their bag of tricks. 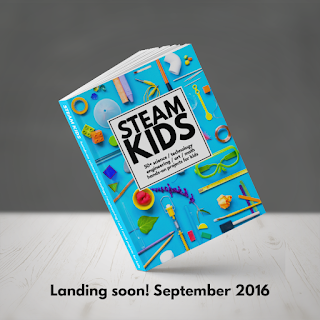 STEAM Kids is available as an e-book (which is the most affordable option), and also available in paperback on Amazon. Readers in the European Union can purchase the e-book here. 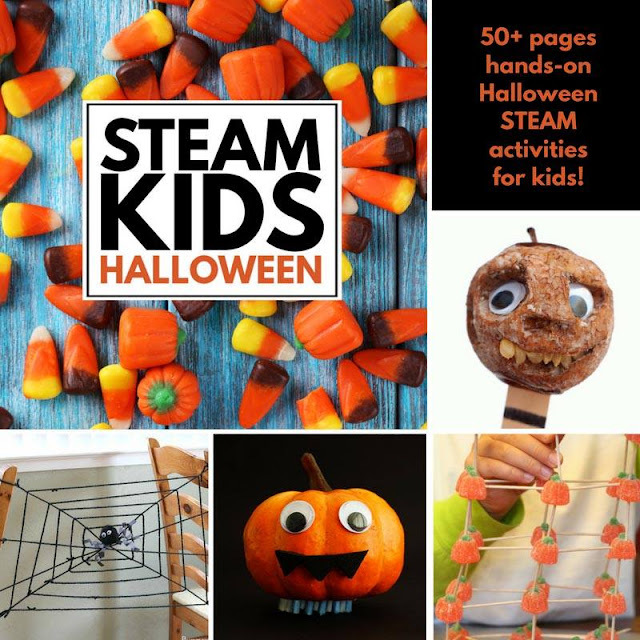 If you like STEAM Kids, then you'll also be interested in the other books in the STEAM Kids series, like STEAM Kids Halloween, STEAM Kids Christmas, STEAM Kids Valentine's Day and other bonus activity books. You can even bundle all of the e-books for a discounted price. 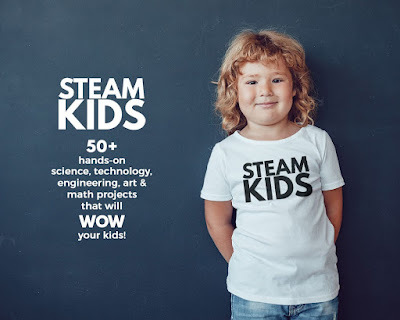 Interested in learning more about STEAM? Here are some additional articles and resources from the authors of STEAM Kids! STEM vs. STEAM, Does the A Matter? I was provided a copy of STEAM Kids for review purposes, but was not otherwise compensated for the post. All opinions here are those of my own. ARRR! It's once again the time of year to brush up on your pirate lingo for International Talk Like a Pirate Day (September 19th). 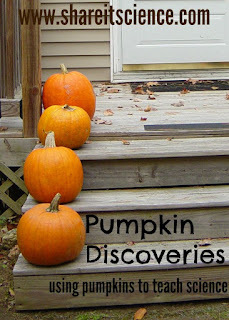 We're excited to participate again in a pirate blog hop hosted by Witty Hoots. In this post you'll find 2 real science experiments that have to do with pirates! The first will investigate how well pirates see while they are wearing an eye patch. The next is a cool telescope optical illusion! (You don't even need a telescope to try it!) In addition to this post, you'll find all sorts of other great pirate activities and fun down below. If you're looking for more pirate science, be sure to investigate last year's post: Pirate Science! Fool's Gold, Parrots and Shipwrecks. 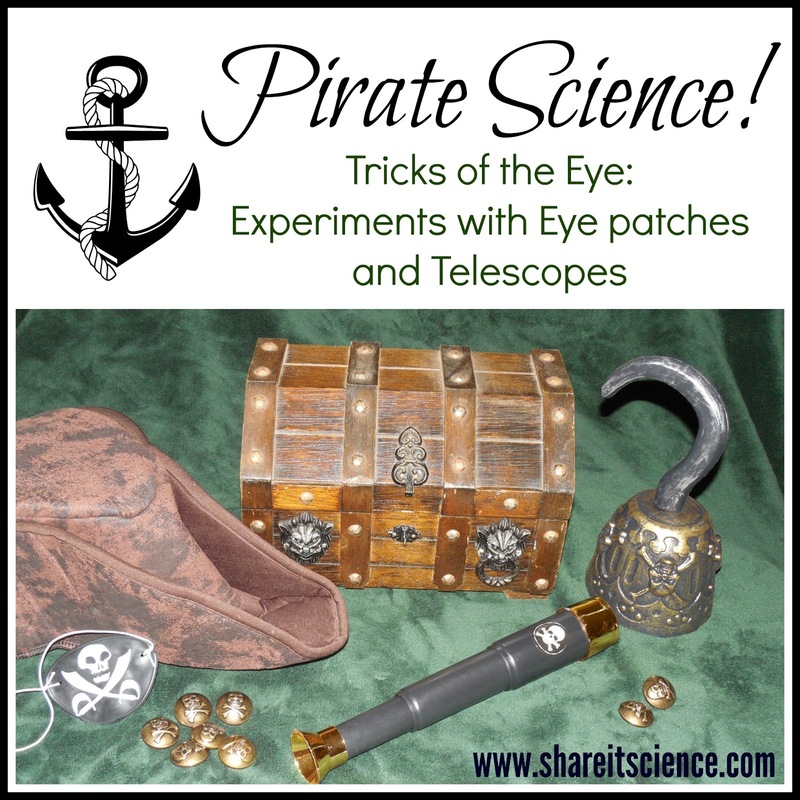 Have you ever wondered how wearing an eye patch affects a pirate's vision? Whether they wear it due to a swashbuckling accident, or simply to help them fit in with the other pirates, an eye patch does indeed affect how well a pirate can see. Most likely pirates with patches would find themselves bumping into things and having trouble aiming their cannons because as you will soon see having just one eye affects your depth perception. Humans have what is called binocular vision. No, you don't have to be holding a pair of binoculars to have it! It means that we have 2 eyes with overlapping fields of view. Any animal with eyes situated on the front of its face has this type of vision. (Chimps and apes, as well as owls, etc.) This type of vision helps us to have good depth perception, or the ability to see things in 3 dimensions and perceive the distance of objects. When you take away one field of view, then it hinders your ability to determine the distance of something. An eye patch definitely takes away one of these fields of view! Try this experiment to see what I mean. Sit down with your first mate at the table. Arrange the cup so that it is about 2 feet in front of you. Ask your first mate to hold your doubloon about a foot and a half above the cup, moving it around slowly. They may have to stand or kneel, carefully, on a chair. It might be best to choose a crewmen who does not have a peg leg! 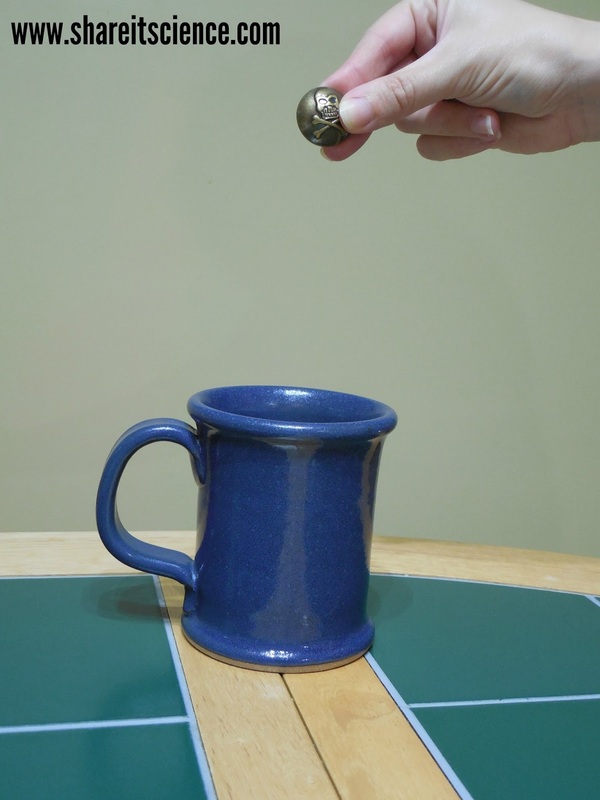 With both of your eyes opened, watch while they move the treasure around above the cup. When you think the treasure is directly above the cup tell them to drop it. Try this several times. What happens? Did the treasure land in the cup? Now put your eye patch on, or cover one eye. Repeat the activity. Try it several times. What happens when they drop the treasure? You most likely found out that it was easier to be accurate when you could use both eyes to see. With only one eye it was more difficult to judge the distance to the cup. This is because with only one eye available, you lost your depth perception! Knowing this, I'm not sure I'd want to sail the high seas if my captain only had one good eye! Now here is a fun experiment to try with your pirate telescope. Hold your telescope in your right hand, and hold it up to your right eye. Take your left hand and hold it up in front of your face, about halfway down the telescope. This hand should touch the side of your telescope. For a good diagram of how to do this, click here. Keeping both of your eyes open, simultaneously look through the tube, or telescope, and look at your hand. Egad! You have a hole in your hand! Quick! Move your telescope away from your eye. Oh good, it must have been a mirage from being at sea for so long, your hand is still intact. Switch hands to try it again and see if the other one is okay. Why did you see a hole in your hand? Each of your eyes sees a different image. Your brain puts these images together. Normally, this works out, but you've tricked your brain a bit here. One eye is seeing the hole from the telescope, the other is seeing your hand. When your brain puts the two images together, you've got a hole in your hand! 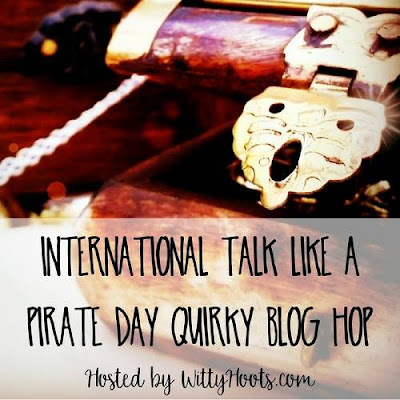 Welcome to our annual Talk Like A Pirate Day Blog Hop! 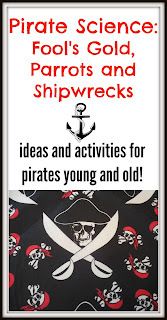 Packed full of ideas, activities and all things to do with the sea, pirates and scallywags! Make the 19th September a fun-filled, ship-shape day and remember to have lots of swashbuckling and arrrrrring as well! Join my pirate mateys and me by hopping over onto the posts below before you walk the plank, me hearties! It may not be officially fall until the Autumnal Equinox, but with the start of school and a chill in the air it does feel like it is already here. This is one of my favorite seasons! I wanted to remind you of some of the fun autumn science posts we've done in the past. I'm also very excited about the posts we have lined up for the next few weeks and wanted to give you a sneak peek! First of all, Talk Like a Pirate Day is coming up! 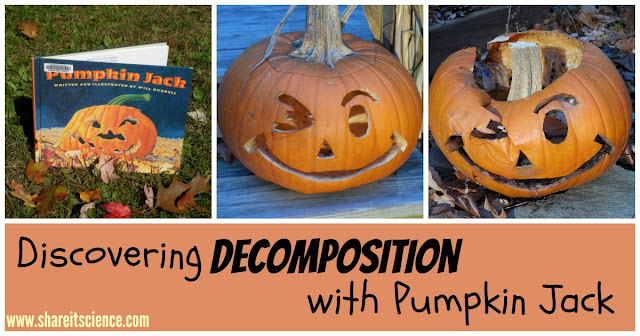 This year I'll be participating in another fun blog hop hosted by Witty Hoots. 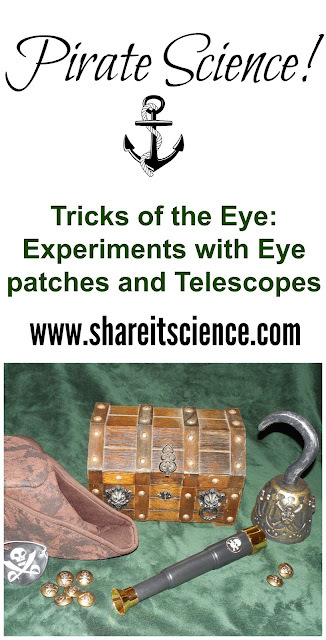 We'll be exploring some pirate science with optical illusions! Check out last year's pirate science post here. 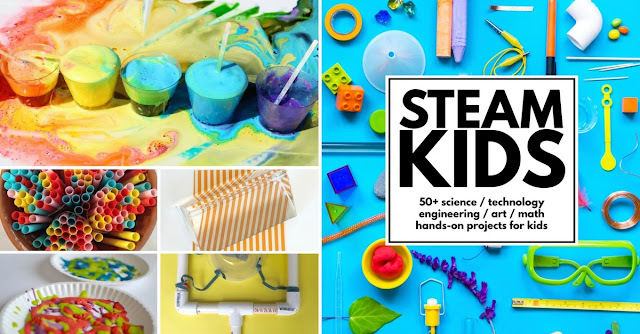 In the next few weeks, I'm excited to share an incredible resource for parents and educators- STEAM Kids, a book chock full of activities that explore Science, Technology, Engineering, Art and Math! Look for my review and more information soon. Over the next 30 days, I will be reviewing www.Science4Us.com. 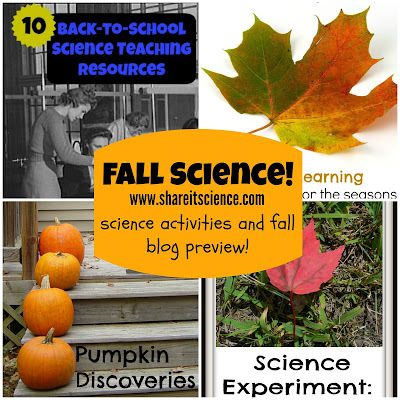 Science4Us is an engaging, elementary science curriculum that teaches science using a fun, interactive approach. If you have your own blog and would like to review Science4Us, check out their homeschool review program. Make sure to come back and read my full review! 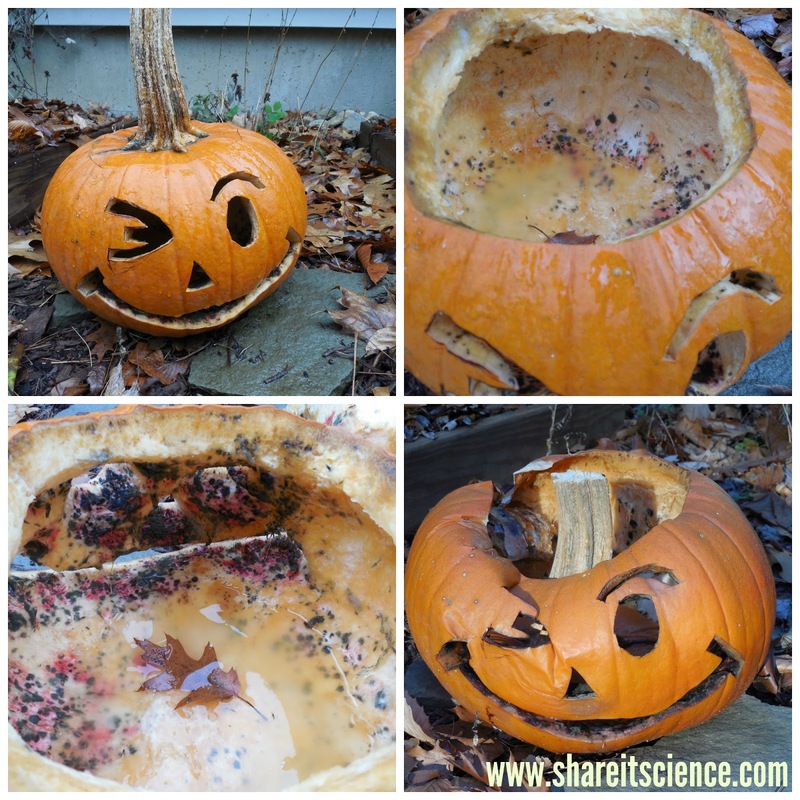 As Halloween approaches, there is always some great science to be done with pumpkins! 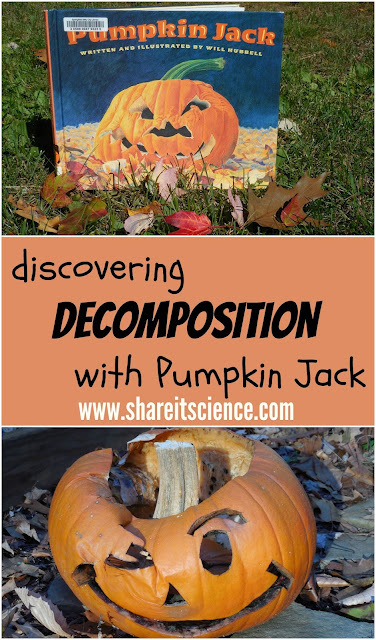 Get ready to make some pumpkin discoveries with these pumpkin ideas and stay tuned for a post with a new pumpkin science exploration of decomposition! Let me let you in on a little secret (that is probably not that much of a secret to some Share it! Science News readers) gardening with children is magic. 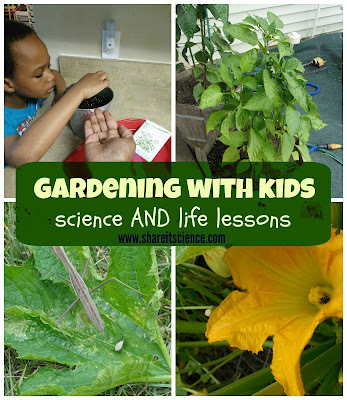 Particularly when gardening with little ones who are still learning the wonders of the world. A school garden, planted by little hands! The past two springs we have had the good fortune of giving away seed packets, generously donated by Renee's Garden Seeds, to Share it! Science News readers. Two of this year's winners recently touched base with me about their gardening experience. They both echoed similar sentiments: growing their seeds into plants was not without trials and tribulations, but there were many teachable moments and little rewards along the way. Our garden was less than successful product wise. We were fighting near drought conditions, chipmunks, a new flock of chickens who eat more of our green stuff than we anticipated, and we are now fighting squash bugs. 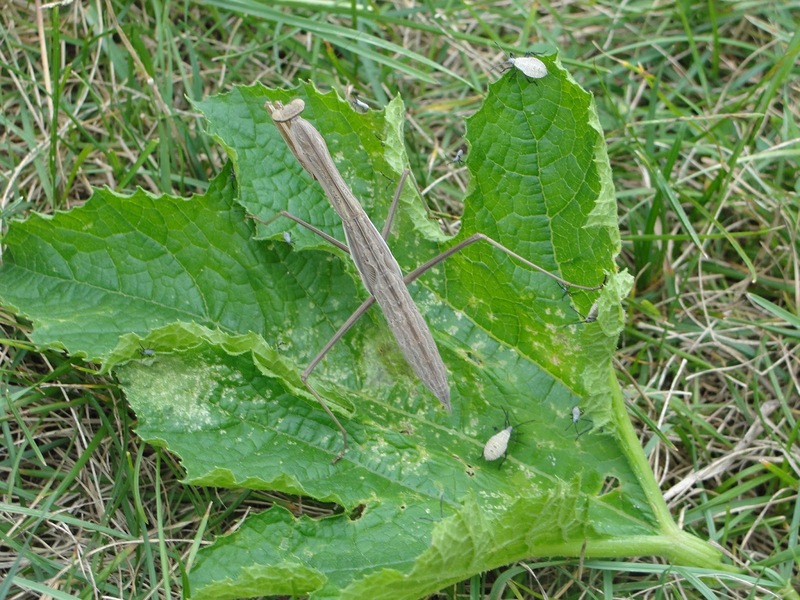 On the good side we were able to watch a praying mantis eat those bugs for an afternoon snack! We were so appreciative of the gift of seeds. We started some plants from seed that we would normally buy as plants. And we are still anxiously awaiting some bell peppers from the plants we were able to save from the chipmunk. 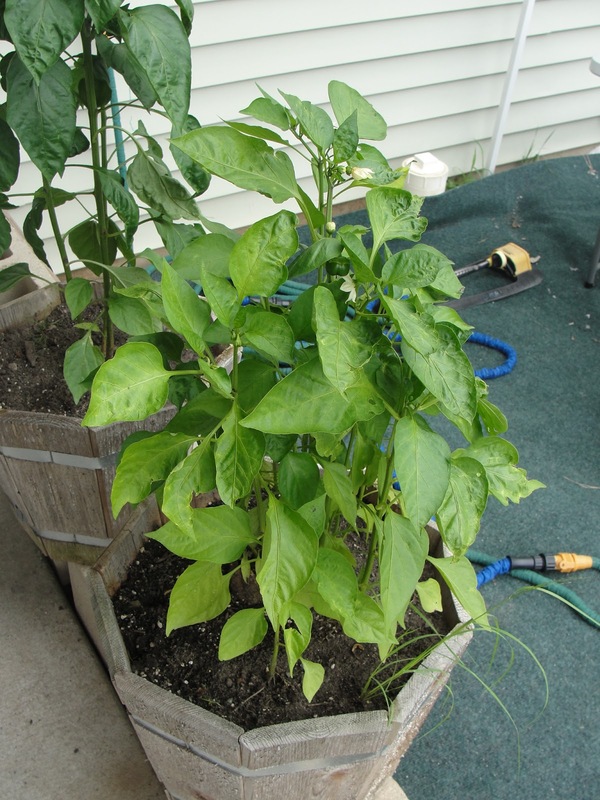 Thank you for the gift:) -Deb T.
The peppers Deb mentions above, from Renee's Garden Seeds. I can think of many times I had similar experiences in my school garden. When you plant a seed you must contend with many factors, like predators and weather, that are out of your control. I'm so glad that despite the challenge, Deb was able to find the teachable moments to share with her students. I love that they were able to observe the praying mantis in the food chain they created in the garden. Science lesson? A plant is one part of a food chain. This food chain is part of an even larger food web. Life lesson? When life gives you lemons, make lemonade. There is always a silver lining! An unexpected teachable moment- a praying mantis munches on the bugs that are munching on the squash plants! My 5 year old son and I planted our seeds and watched them sprout but unfortunately I placed them in the Texas sun too early and they died. He was so sad but I still have a few more seeds that we will plant in early spring next year. The experience with him was awesome. Thank you for the seeds that brought us both experience and education that we will never forget. We had a great time planting them and checking on them daily with a lot of enthusiasm, talking about them and watering/spritzing them. Sarah, I did not realize the harshness of the sun until I placed the sprouted plants outside to get a little sun, in about half-hour they were wilted and even the ones that were not fried by the heat of the sun eventually died within two days. This was also a great learning experience too. Failing is learning because now we know what not to do. We are looking forward to another year of growing our plants. 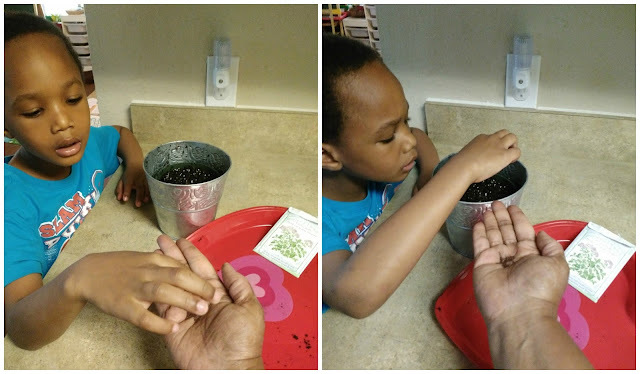 Tina's son plants his Renee's Garden Seeds. I love Tina's story of growing seeds with her son. Although they weren't as successful as they hoped, a new interest was sparked in a young child. 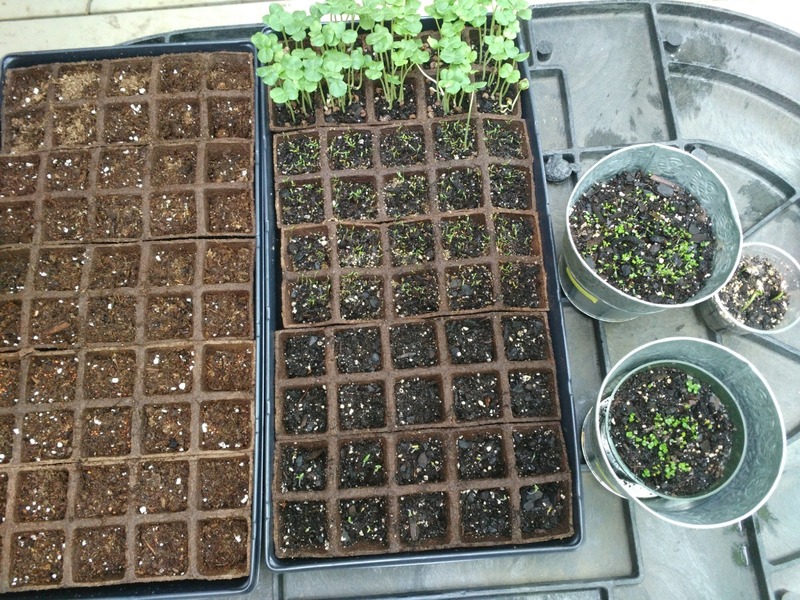 Despite the fact the seedlings did not grow to maturity, her son is still anxious to try again next year. They learned what to do and what not to do through the experience. I've certainly cooked seedlings, accidentally leaving them closed up in the cold frame on that first really warm sunny day of spring. Although it is disappointing, it only makes you want to try to grow them again! Science lesson? A seed will germinate given soil, water, air and light. Life lesson? If at first you don't succeed, try, try again! In addition to my seed giveaway winners, I checked in with other colleagues who garden with kids. 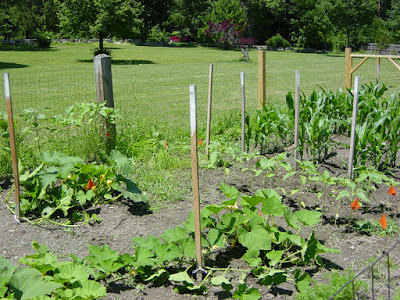 I did quite a bit in the garden this summer with IslandWood summer camps. I taught three weeks of 4-5 year olds, and one week of 6-7 year olds. We mostly accessed science in the garden through the study of pollinators. One week, we focused on super powers of the natural world. The week began with an examination of flowers, and a discussion of their incredible abilities to make fruits and produce seeds. In IslandWood team building fashion, students then learned that the flower super powers were augmented by other natural superheroes: honey bees, butterflies and hummingbirds. Students learned about the inner-workings of a hive, differences between moths and butterflies, and made feeders for hummingbirds. Curricula on hummingbirds is sorely lacking, and this was the toughest day to teach. I designed an easy to make hummingbird feeder, and had kids carry around guide books looking for hummingbirds in the garden--this ended up being the most popular day! I love that this program used the idea of super powers to make learning magic for the campers. Seeing how flowers, and ultimately the food we eat, are dependent on pollinators is such an important lesson for kids. Science lesson? 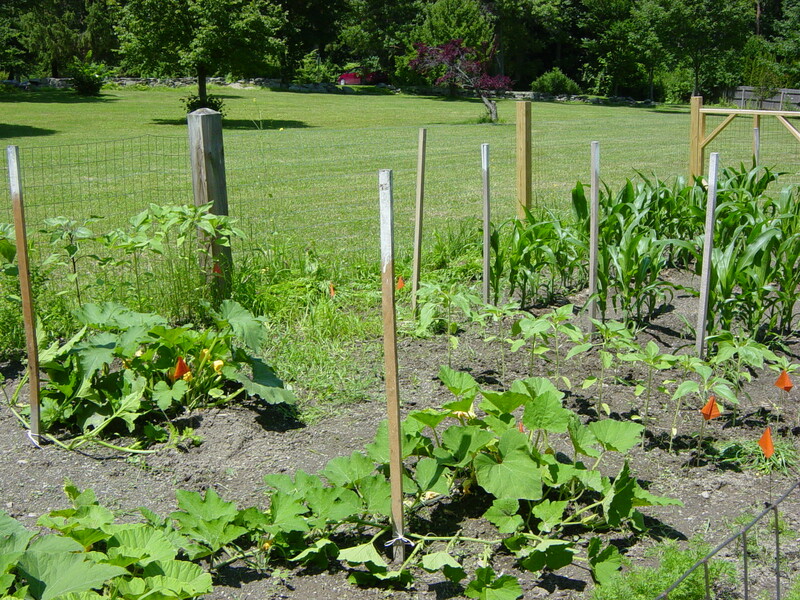 The many parts of the garden ecosystem work in sync with one another. Each organism has a job and a special niche. Life lesson? It takes many different types of organisms with different strengths to make ecosystems, and societies, run smoothly. We are deeply connected to the natural world. 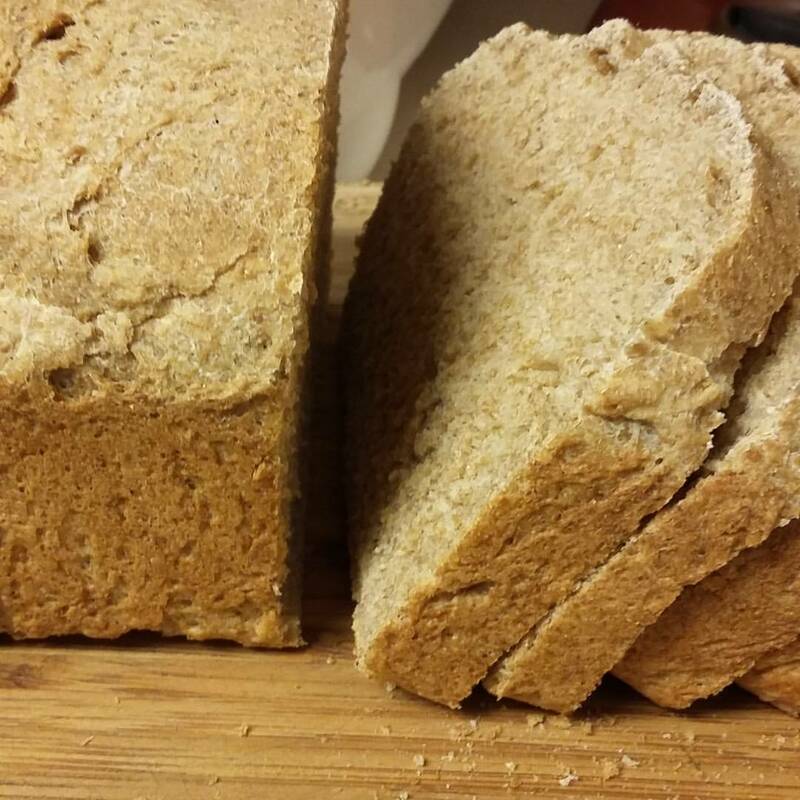 This morning we ground the wheat the kids grew in the garden and made it into bread. It was so fun seeing them realize we could either eat the seeds or replant them. They learn so much from growing their own food! I think it is so awesome that these kiddos got to see this whole process from start to finish! So often in our society the middle-man has taken care of the jobs like harvesting and grinding the wheat to make our bread. What a gift to have this experience! Science lesson? The "flowers" of grasses look different than other flowers. The top part of the wheat is the seed producing flower. Life lesson? Most of the time it is worth it to do something the "old-fashioned" way. 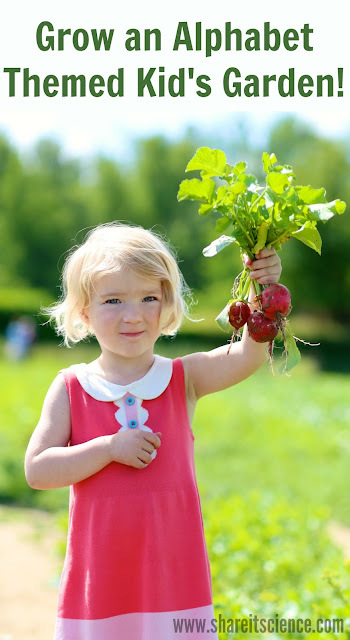 Are you inspired to try to grow something with a child next spring? Follow my garden Pinterest board for some inspiration!